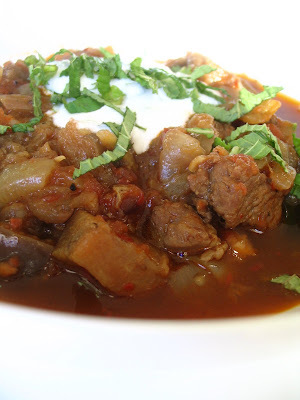 The only best-results-guaranteed lamb stew recipe I have takes between 2-3 hours of cooking. So it's not a recipe for emergency cravings. Although it's very easy to make, you have to start 3 or 4 hours before the meal. That's why I consulted the recipe book that came along with my precious smart pressure cooker when I was craving lamb stew and was too hungry to wait for 3 hours. I got the pressure cooker and the recipe book almost two years ago, and although I used the cooker almost every other day I didn't check the recipe book for even once. It got dusted on one of the shelves. Although there was actually a lamb stew recipe in the book, my expectations were really low not only because it was one of those thin generic recipe books, but also the recipe was categorized too generally--at least for someone from the Middle East--as "middle eastern": what part of that region the recipe came from was a mystery. Anyways, despite the confusing geographical definition and my low expectations the recipe with a couple of additions and changes turned out to be just perfect. -Heat the oil in big pot and brown the meat on all sides. -Add onion, garlic, and eggplants. Cook until onion is soft. -Add the remaining ingredients (except for yogurt and mint leaves). Season to taste. -If you have a pressure cooker, cover and first bring to full pressure over high heat and then reduce heat to low. Cook for 15 minutes. Remove from burner and release the pressure. -If you don't have a pressure cooker, bring to a boil. Then turn heat down to low. Cover and cook for 30-40 minutes. -In a bowl mix yogurt and mint leaves. -Serve the stew with minty yogurt on the side or on the top. -Get your bread toasted, because the juice of this stew is not to be wasted! Honestly, at first I didn't get the minty yogurt sauce. Yogurt is always good and refreshing with heavy stews, but why fresh mint? But after I took a bite, everything was clear. That strong and refreshing mint flavor mingled with cinnamoned and cloved lamb is simply rewarding. And for that big change that little bit of fresh mint causes, I decided to post this recipe for Weekend Herb Blogging which was founded by Kalyn and is hosted this weekend by Anna of Morsels & Musings. 0 Response to "Middle Eastern Lamb Stew (Orta Doğu Usulü Kuzu Güveç)"